Jun 20 2016 by Greg Moran. This year’s Apogee 3 event will take place on the weekend of August 6th 2016 at TechShop-DC in Arlington, VA.
Mach 30 is preparing for our 3rd annual Apogee event to grow the Mach 30 community through in-person face-to-face interactions. We are looking for individuals or groups who are interested and available to speak or exhibit. The event is scheduled for August 6, 2016 and we are would love to include any group or project to have representation from the local community. We hope that you know of folks who are available to participate! Why: To showcase your projects related to spaceflight with an emphasis on Making or Open-source processes. What: Space-related Makerfaire-style event with exhibit booths and speakers/presentation program. Registration: Free for 1 exhibitor or speaker, $10 registration/each additional person. How: Let us know by using this Google Form within the next 3 weeks (no later than July 3, 2016) if you would prefer to exhibit or speak. The assignments of booth space and speaker schedule will be finalized on July 10, 2016. Exhibitors will receive 1 free admission ticket, a 4×4 ft table (share a 4×8 ft table) with power and wifi. Additional resources may be available upon request. Double Exhibitors will receive 1 free admission ticket, a 4×8 ft table with power and wifi. Additional resources may be available upon request. Speakers will receive 1 free admission ticket, a 30 minute window (we recommend leaving plenty of time for questions) to present their story, and audio & video projection equipment. Additional resources may be available upon request. Apogee is Mach 30’s annual gathering for its volunteers and fans. One part conference, one part public outreach, one part Makerfaire, and one part party, Apogee 3 has something for everyone. Mach 30 has long held that meeting in person is an essential part of our work and key to accomplishing our mission of hastening humanity into a spacefaring civilization. So, join us at Techshop, this August for a chance to meet your fellow volunteers and the Mach 30 Board in person and to celebrate our shared passion for open source spaceflight. Aug 5 2015 by Chris Sigman. First off, thank you everyone who attended Apogee 2 this year! From volunteers to people learning about Mach 30 for the first time, you all helped make it a success. The event went well, with new people getting a good deal of exposure to Mach 30 during our outreach event at NoVA Labs, and a lot of great planning work the following days at the board retreat. While this year’s event was different than last year’s, in a lot of ways it was the same. It was one part conference, one part public outreach, one part hackathon, and one part party. Apogee 2 still had something for everyone. 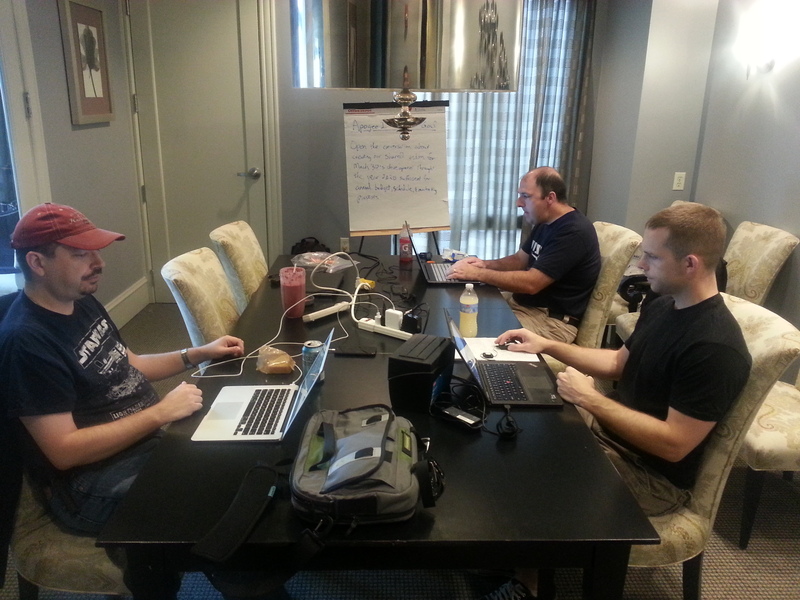 Apogee 2, Day 1 – Work Party and “bake-off” for 2 software development platforms. 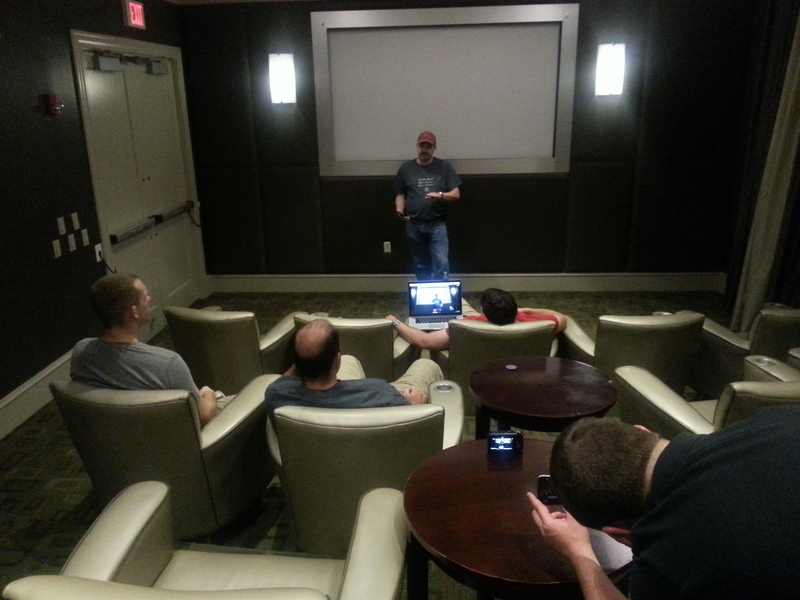 Held in Arlington, VA at The Continental Condominium Skyview Conference and Party rooms, the event kicked off with a work party. The objective was to try out two software development platforms, Kivy and LiveCode, by developing a graphic user interface (GUI) for the Shepard Test Stand. We spent about 2 hours developing a pair of prototype GUIs using each of the platforms. We worked in a hackathon format and found that it’s a little too early for us to tell which one would be better to leverage. Kivy was perhaps quicker to develop back-end logic in, but LiveCode had a nice, easy to use interface for laying out things like buttons and other controls. We plan on looking into them both more! We held our public outreach event, hosted by Nova Labs, on Saturday afternoon. It was a series of TEDx style presentations by the three Mach 30 Board members on the topics of Making, Spaceflight, and Open Source Development at Mach 30. In-between each session, attendees had the opportunity to talk with Mach 30 members and volunteers about the projects the organization works on, and generally socialize and pick our brains. It was great to see new faces, and spark some new ideas in other peoples minds. This was one of the most exciting parts of the conference for us. Apogee2 State of the Organization and Volunteer Appreciation. Saturday wrapped up with Mach 30’s president J. Simmons state of the organization address and Mach 30’s annual recognition event to honor the hard work of the volunteers. This year, we crowdsourced the nominations for the most noteworthy contributions, both team and individual. There was a lot of recognition to go around, and some themes that both volunteers and board members noticed. Coincidentally, J’s state of the org address touched on many of the same points. He ended the evening with a call to action for everyone associated with the organization to bring in one new person by Apogee III, next year. It would be a small thing for each individual to do, but it would mean a great deal to the organization – it would double our size, and extend our reach even farther. Apogee II continued with the annual Strategic Planning Board Retreat on Sunday and Monday. The board used these sessions to review Mach 30 activities including the Perigee II event last January, and to reflect on what the organization did and didn’t do well. This year the Board applied Agile methods during the retreat, continuing work started at Perigee II. Part of the reflection activity included identifying things we should do differently in the future. This retrospective was a very valuable exercise and we intend to do more of it. Our hope is to make planning and other board level activities more effective as we continue to adopt Agile methodologies. Thank you again to everyone that helped make Apogee II a success, and special thanks to our Vice President, Greg Moran, for his hard work. He did most of the heavy lifting for planning the event, and it might not have happened had it not been for him.